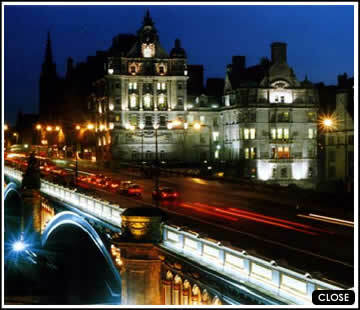 Located on Edinburgh's historic North Bridge, the Scotsman Hotel is a contemporary city hotel with a distinctive Scottish flair. Guestrooms are individually decorated and equipped with state of the art conveniences including DVD/CD players, wide screen TV and Internet access. Fine dining is available in the luxurious Vermilion Restaurant and the popular, less formal, North Bridge Brasserie. The Scotsman also offers a complete modern fitness facility with a stainless steel indoor swimming pool, gym, sauna, steam room and Jacuzzi.